I have two words for you Penn Manor: soups on! Mindy Rottmund’s advanced foods class took part in a cook-off today and the results were simmering. Wednesday the students spent their time cooking two separate entrees which were then tasted and judged. The unit was based on the movie “Julie and Julia.” The movie is based off of the famous cook Julia Child and her many recipes. “I had gotten the movie for Christmas and was excited about it. The kids had participated in a Rachel Ray challenge before so they knew what to expect,” said Rottmund. All four groups had to create Child’s Boeuf Bourguignon along with another one of her famous soups. Billy Brice, a chef from Mazzi’s restaurant in Leola, and Krista Cox, Penn Manor High School’s assistant principal, served as the two judges during the competition. Brice got involved in the event from a local connection. “I knew Billy from the hotel restaurant where I work,” said Zach Ross, a senior at Penn Manor. Each student had their own role to play in the making of the soup and Brice found the results of their teamwork quite tasty. “I was very surprised by the garlic soup. I’d never had it before and didn’t think much of it, but it tasted pretty darn good,” said Brice. However, one team did not finish in time and was not allowed to compete. “They just didn’t work well together,” commented senior Brandi Kauffman, one of the participants in the cook-off. The judges had to grade each dish on a one-to-five scale in categories such as visual presentation, aroma and flavor. Rottmund had high hopes for her class and was satisfied with the end results. Ross, who plans to attend YTI in his near future, has much appreciation for the class and the skills he is learning. “All the activities we do are going to be helpful for college and my future career,” said Ross. However, at the end of the day, it seemed all that mattered was who took home the gold. 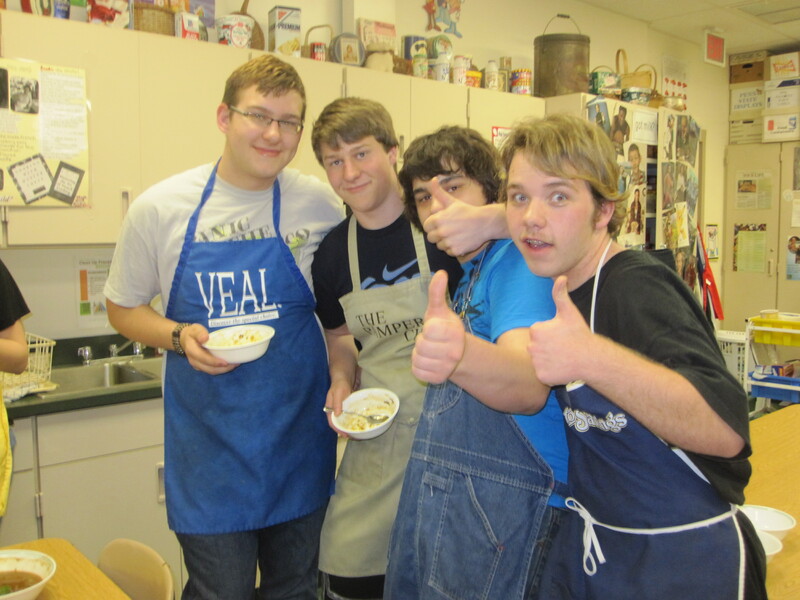 Contestants in Penn Manor's first French cooking contest stir up delicious meals. In the Boeuf Bourguignon competition, the first place award went to “the boys”-Zach Ross, Cory Horst and Vaughn Stetler with 52 points out of 60. Second place went to Mariah Landis and Stephanie Carroll with 45 points out of 60. The second soup that each group made also received scores out of 60 points. First place with 49 points went to Zach Ross, Cory Horst and Vaughn Stetler for their outstanding cassoulet de porc et de Mouton soup. Second place with 48 points went to Brandi Kauffman and Cory Bowman for their soupe de poulet, or strained chicken soup. Third place with 47 points was awarded to Emmy Hess and Kendra Keuper for their garlic soup. Overall, the judges thought the food was a hit. ĺ řêäĿŁÿ ĻĺĶē ŤħĒ ãČčĖŃŢ ἳŅ ŧĦé ţįŤĽĒ.